December bustled in with its usual tinsel-edged blur; a flurry of fairy lights and fake snow, sentimentalism and overindulgence. Festive smiles seem ever more forced though. Money is tight and political uncertainty, no matter where you sit, does little to inspire the notion of fun. It can be a tough period for the self-employed. As much as the break is welcome, the wind-down and subsequent New Year lull can lead to two or three weeks of empty income. There are, however, some advantages to being your own boss. With so few hours of daylight to play with, angling opportunities are limited, but I can also juggle my day. By staying local, and keeping my fishing simple, I can pop out for a couple of hours in the afternoon, fish until dark and still squeeze a couple of hours work in before supper. 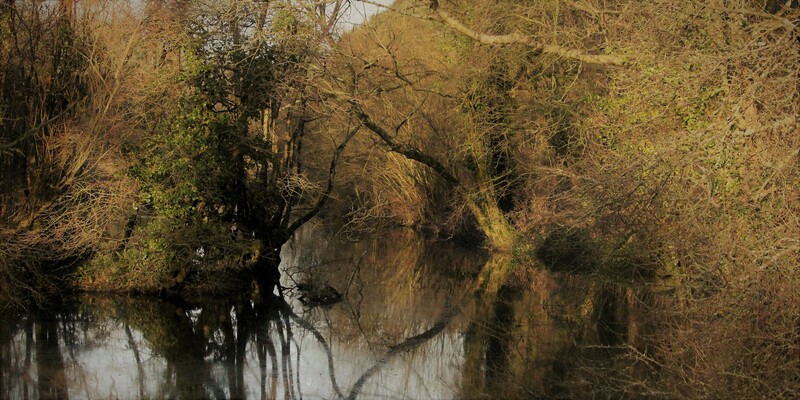 Normally, to make the most of the time, I would be heading to the local rivers for such moments, fishing light and keeping active. Trotting maggots or bread and enjoying whatever comes along. This autumn though, my fishy thoughts have been unerringly single-minded. With a pod of big perch within a short drive of home, I wasn’t going to be casting anywhere else. I met Chris for an afternoon, and we headed to the Boathouse swim where Matt and I had enjoyed good sport the preceding week. 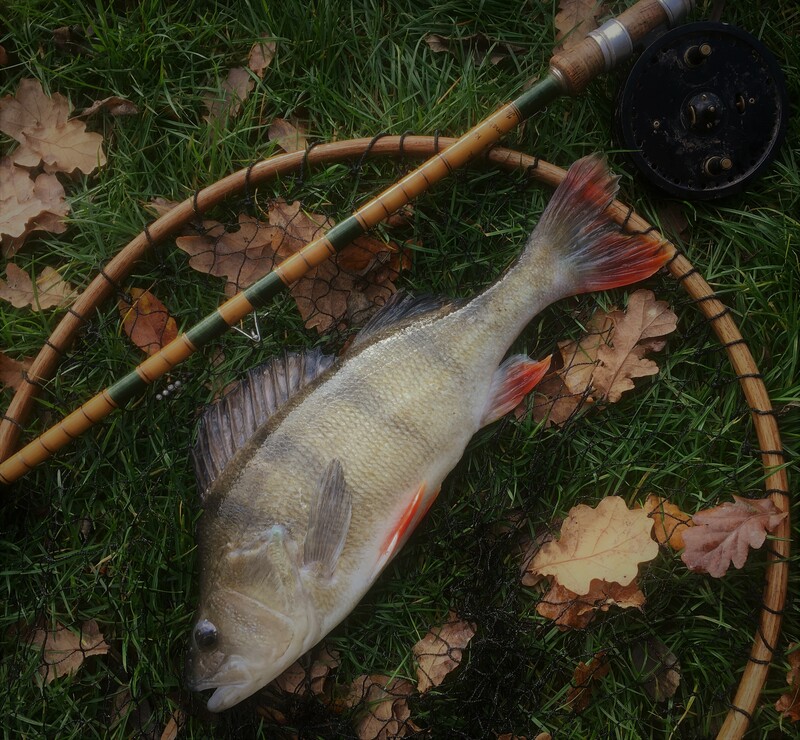 Chris followed Matt’s example and hooked a perch within seconds of his first cast. It was slightly smaller than Matt’s fish—a few ounces short of two pounds—but filled us with confidence for the following couple of hours. Roach and rudd were soon swirling at the loose-fed maggots, and a steady trickle kept them simmering nicely. The activity would hopefully keep the big perch stirred, but in the mean-time we would have to endure buffeted baits and a succession of micro perch that were often smaller than the bait they snaffled. Then I had a more decisive bite. A distinctive donk before the float slid steadily sideways. The resistance was solid, and for a moment I wondered if I had hooked a carp. 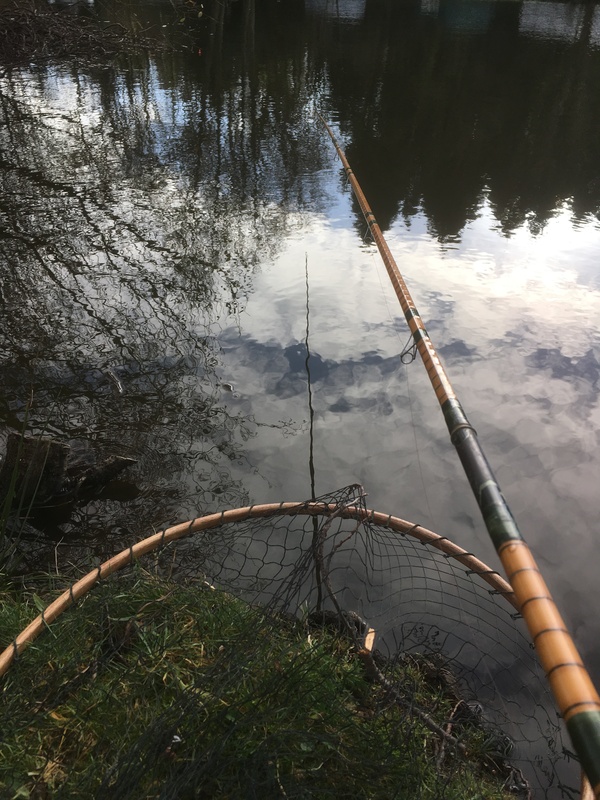 The fish lunged towards a semi-submerged post and I lifted the rod high, standing up on my toes, to let it run behind the danger and into open water. The line flicked the corner of the post but didn’t find a sharp edge and I worked along the bank to try and let the fish run itself tired. The bite had seemed very ‘perch-like’ but the initial power had made me think of carp. Then came a sudden rush that jarred down the rod-tip and fizzed the reel drum against my thumb. Pike, I thought to myself, and a couple of moments later, as the fish slowed and turned beneath the surface, Chris confirmed my suspicion. I put more pressure on the fish—there was no need to let a small pike tire itself unnecessarily—and as it neared the net so it joyously grew stripes. In the water (and having felt the power of the thing), I thought I might have hooked a big three. 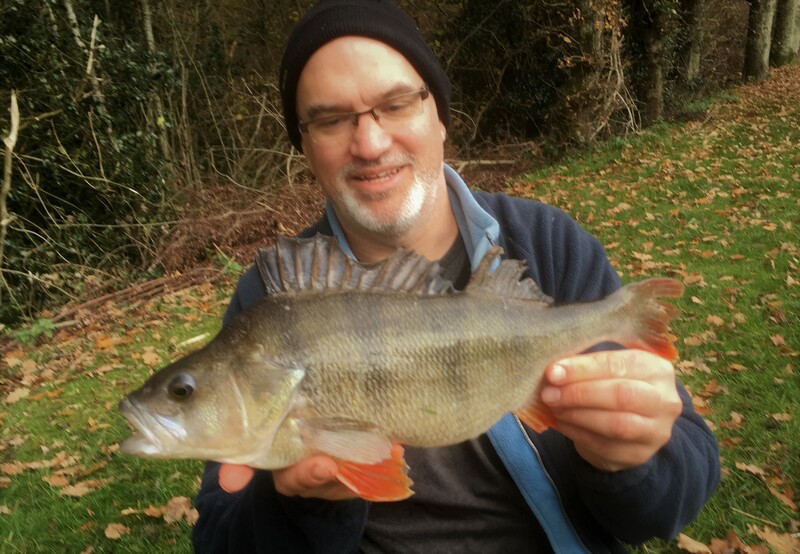 On the bank, the frame bore out that thought—this was a perch an inch or two longer than the three pounder I caught last week, but it was lean-bodied and took the scales to 2lb 13oz. I didn’t mind too much, it was probably the best fight I have ever had from a perch, and there was plenty of time for another. A chance came almost immediately, but after a couple of headshakes and another dive towards the sunken post, the hook pinged free. I checked the point and found it still sharp, vowing instead to give the next bite an extra second before I struck. Chris meanwhile had tied on a size 4 to deter the small fish, and threaded on half a dozen worms that would hopefully take some time to whittle. The trick worked, and Chris’ rod took up a very satisfying curve as a heavy fish hung deep. “Carp?” I ventured, but as I watched, the rod-tip rattled a couple of times as the fish shook its head. “Perch!” we said in unison. Now it was Chris’ turn to tease a good fish away from the snags, which he managed without too much difficulty. Again, as the perch found open water so it ran, and Chris’ nerves seemed to flutter. “It’s a good fish,” he said, as the clutch slowed. I grabbed the net and crept around behind him, the rod-tip rattling again in response to a head-shake. The hook had pulled. We said nothing. That was a big perch. Chris readied the kettle as I fished on, hooking another fish that stayed close to the bank and came to the net with unexpected ease. It was actually an ounce bigger than the first fish, making a lovely brace, and was soon followed by a couple of pounders. We both felt sore about Chris’ lost fish, though, and I think we both knew it may have been something very special. I was soon back with Matt, but this time the fish in the Boathouse swim were not quite so responsive. Matt moved to a different area and lost a big fish before landing a deep-bodied perch of 2lb 9oz. I persevered in the Boathouse and finally got lucky on a prawn just as the light was fading. It was another fish of 2lb 14oz, but the fourth different fish of similar size from that swim. It seemed that we had still only scratched the surface in terms of potential, yet the mood of the place quickly changed. Martin had been due to visit a month previously but had been forced to delay due to work commitments. Instead, he arrived in December along with darkening skies and strong winds. Far from ideal conditions for perch fishing, as we found. We both had chances, Martin losing a couple of good fish, while I caught a 2lb 9oz perch that was likely the same fish that Matt had previously met. However, it felt as though I had overstayed my welcome, and a further visit by myself seemed to prove the point. Even the Boathouse was deserted and I headed into Christmas with my thoughts drifting back to running water.